New Home Sales came in much stronger than expected, at an annual rate of 619,000. This is the highest level since early 2008. While it is premature to bust out the champagne quite yet (prior to the bubble, the last time sales were this low was the early 90s), it is an encouraging sign. The Spring Selling season got off to a somewhat slow start, but seems to be picking up momentum. Note this number has an unusually wide margin for error this month, so expect a revision. Speaking of new home sales, we got second quarter numbers out of Toll Brothers this morning. Earnings beat on the top and bottom lines, with revenues increasing 31% in dollars and 9% in units. Interestingly, average selling prices of signed contracts were flat. Contracts only rose 3%, and the problems were in California, with not enough inventory for sale. They continue to build out their urban apartment segment and plan to expand it to smaller cities and suburbs. The Richmond Fed manufacturing index fell in May to -1 from 14. 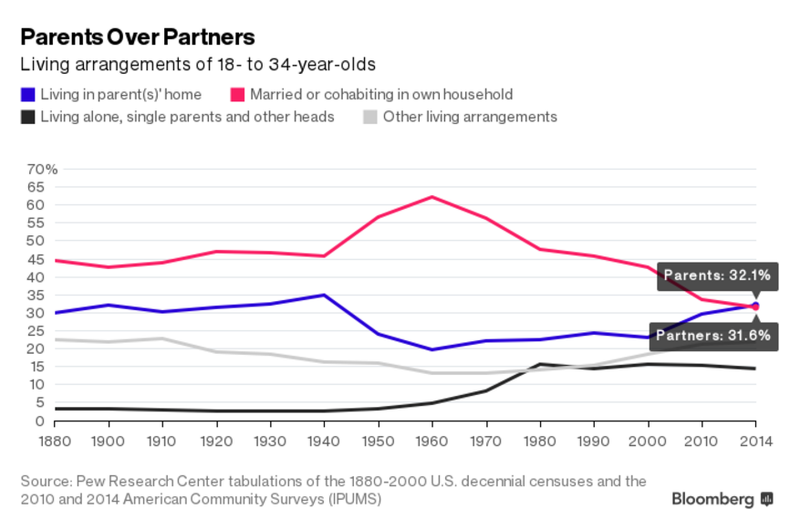 More millennials are living with their parents than they are with a partner or significant other, for the first time in the modern era. This is probably a reflection of a lot of things – from the weak economy to people getting married later in life. However, it does represent pent-up demand for housing. Foreclosure starts fell to 58,700 in April, the lowest level since 2006. 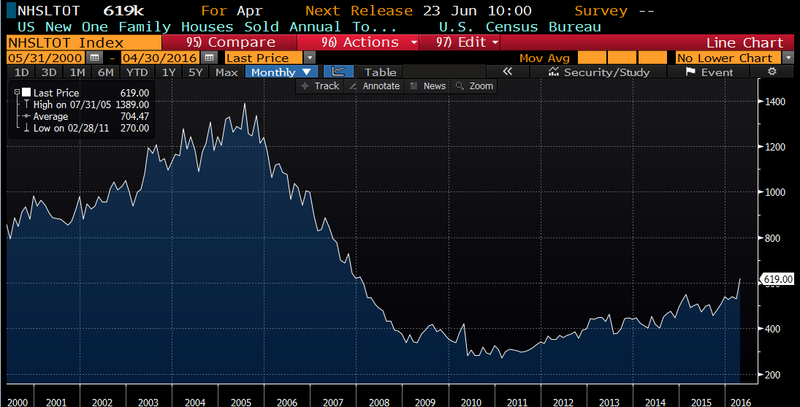 Delinquencies increased slightly, but are still down 10% YOY. The active foreclosure inventory fell below 600,000 for the first time since 2007. The Northeast still has some wood to chop in terms of liquidating foreclosures. Pent-up demand is one possibility. There are others. Interesting piece on the return of robo-calls. I’d kick mine out if I didn’t want to get her through college to (hopefully) reduce the risk of her ever coming back. New York City Mayor Bill de Blasio has proposed a solution to Staten Island’s burgeoning deer population. To keep numbers in check, de Blasio plans to authorize a three-year experiment in which all bucks are given vasectomies, then released back into their urban environment. Price tag: an estimated $2 million. The logistics of this misguided form of wildlife management alone show the plan is doomed to fail. The number of deer in Staten Island has jumped from two dozen in 2008 to more than 700 in 2014 — certainly well north of that figure two years later. Capturing every buck is practically impossible, despite the intended use of air-dropped nets and tranquilizer darts. An article from Staten Island Advances’s silive.com said the city would be nuts (their words) to try to sterilize every buck in the herd. I think he has value as a representative example of what happens when the left gets power. At least people can’t say they weren’t warned now. But then I don’t live in New York City. Somehow I suspect that anyone who doesn’t already know what happens when the left gets power won’t be able to see the connection between DeBlasio’s (and Obama’s) insane policies and their progressive influences. The kids seem to need to learn the lesson anew. NoVA was right: East Germany was a useful example to point to. East Germany was a useful example to point to. Venezuela seems to be a good one now. It was already clear. But this helps to underline it. Boy, that poor city. They need to get rid of him. They need to get rid of him. DeBlasio reminds me of Woody Allen’s banana republic dictator. Obama is just capitulating to the latest progressive mass delusion. A sign of things to come! Add in Trump, the apocalypse is nigh. I don’t think he is capitulating to anything. He is a primary driver of it.